Going to a tablao (flamenco venue) is a fantastic way to experience flamenco in Madrid, but not the only way. What about hitting a flamenco bar? The experience may even prove more interactive — you may end up making friends and/or dancing flamenco yourself until it’s time to head for chocolate con churros! So, in an attempt to help you have a very flamenco night out, here are my favourite flamenco bars in Madrid — a mix of tapas bars, clubs and, well, strange holes in the wall. Get ready to have the flamenco time of your life. You should never face a flamenco night on an empty stomach. So head to my favourite tavern in La Latina, Taberna Sanlúcar, and order some of their delicious Andalusian dishes — their tortillitas de camarones (shrimp fritters) and huevos rotos (fried eggs on fries, served with a yummy tomato sauce — salmorejo) are to die for. Pair your food with a glass of dry sherry and you’ll be halfway to flamenco heaven. Entering this bar is like stepping into Andalusia for its vibe, music and décor, and the staff are some of the friendliest people behind a bar I have ever met in Madrid. 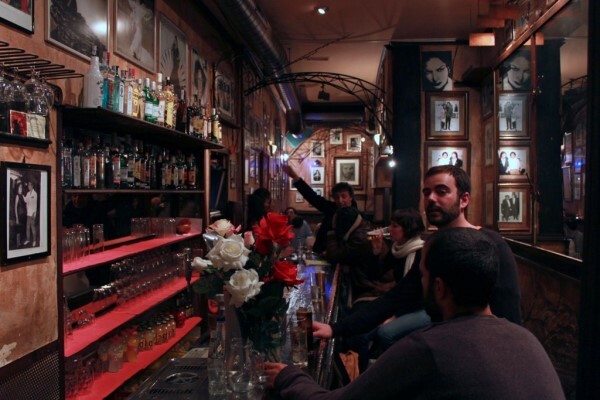 Besides being one of the best places to see a flamenco show in Madrid, Casa Patas also doubles as a bar and a restaurant, with a decent wine selection by the glass, and guaranteed flamenco music on the speakers. Its walls are covered with gorgeous old photos of flamenco artists, and you’re actually likely to spot some flamenco performers enjoying a drink before and especially after the 10.30 show finishes. O’Pulpo is the bar next door, Galician-inspired but also highly flamenco: musicians, singers, dancers, flamenco students from the school upstairs and aficionados alike gather here before and after shows/classes to eat the cheap food and booze to fuel their conversations about all things flamenco. You may actually bump into me, given my busy timetable in the flamenco school upstairs… make sure you say hi! Perfect for a caña (small beer) and the free tapa you’ll get — in case you’re still hungry after the feast at Taberna Sanlúcar. A scene you may encounter at O’Pulpo if you get lucky! This bar lives and breathes flamenco. Dolores Carbonell (related to late flamenco god Enrique Morente) and flamenco dancer Juan El Mistela run this flamenco temple, just around the corner from Plaza Santa Ana. It fills up from midnight onwards on the weekend, and it’s frequented by renowned artists. For instance, guitar player Niño Jero or singer Juan Villar have been spotted there not long ago. Just sit on a stool at the bar and sip on a rather expensive doble de cerveza — just like me in the photo —, let the flamenco music sink in and admire their wonderful collection of flamenco memorabilia decorating its walls. 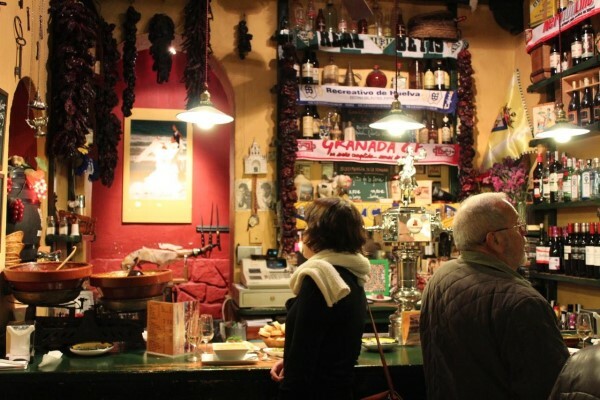 This is a tavern where many a local in Lavapiés feels right at home. It’s cozy, welcoming, warm in winter, cool in summer. The first time I came here, the charming Manuel was serving cañas while singing por alegrías… I was sold. They have a few tables outside where I love to busk in the sun in early spring mornings, cup of coffee (or beer for the early birds) in hand. 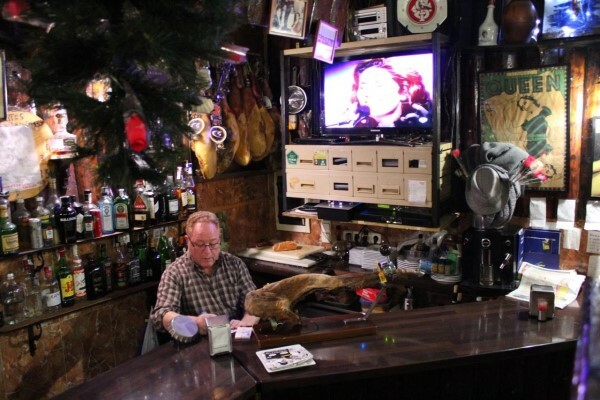 If you’re flamenco-obsessed, this bizarrely decorated bar is just what you need – Vicente plays an extensive selection of flamenco videos on his TV non-stop. Also perfect if you want to have dinner out on a tight budget: a beer costs €3 and comes with a free and substantial tapa of ham on bread with a delicious tomato spread. Don’t miss the upside down Christmas tree hanging from the ceiling (in the foreground of the photo above!) – cheeky Vicente says his neighbour upstairs waters it every day. A very flamenco thing to say. Want more than just hitting up flamenco bars in Madrid? I offer private flamenco tours during which I’ll give you a full and fun understanding of this fabulous art form, lead you through the city’s most flamenco neighbourhood and take you to the best flamenco show, hand-picked by me. All photos courtesy of James Blick (a.k.a. hubby) — thanks, darling.